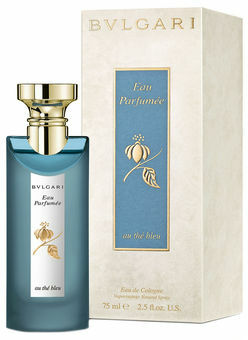 Eau Parfumée au Thé Bleu is a new fragrance of tea collection by Bvlgari arriving after the following editions: Eau Parfumee au The Vert, Eau Parfumee au The Blanc, Eau Parfumee au The Rouge which will, as announced by the brand Bvlgari soon be available in 350ml flacons , besides the existing 75ml and 150ml EDC. The latest edition Eau Parfumée au Thé Bleu is based on notes of Oolong tea (Chinese Fujian tea), combined with blue tea, iris blossom and aromatic lavender, and is created by perfumer Daniela Andrier. The fragrance arrives in blue flacon made of frozen glass designed by Thierry de Baschmakoff. Flacons 150ml and scented candles 600gr will be presented separately and available at Bvlgari store in Rome, at Via Condotti. Eau Parfumee au The Bleu was launched in 2015. The nose behind this fragrance is Daniela (Roche) Andrier.